This Stage asks us to try out lots of different techniques used to apply fabric pieces and I was really looking forward to trying out some techniques for the first time. I have worked with patchwork, piecing fabrics together using applique and then quilting in the past. More recently I have been subscribing to Jude Hill’s Blog ‘Spirit Cloth’ and enrolled in the online course ‘Spirit Cloth 101’. Jude Hill demonstrates through video and audi recordings many ways in which she pieces fabrics. She uses a lot of techniques used in Japanese Boro – which I am fascinated by. She usually starts off by basting pieces of cloth onto a light background such as muslin which makes the fabric easier to handle. It is a fairly free process and I have enjoyed making a number of different samples – piecing pieces together and adding sashiko stitching. This was a good way to use some of my vintage Japanese fabrics. Last Summer, I attended a workshop in France with Gwen Hedley, ‘Flavours of France’. For my final piece I gathered together photos, sketches, printed pieces, all inspired by a visit to Cahors and assembled them in to a collage mixed media piece. I included pieces of printed paper, photos, scrumpled paper as well as printed calico. The pieces were pinned but that is as far as I got. Inspired by Assignment 3, I decided to get it out again and concentrate on applying the pieces to a calico background using Bondaweb and stitch. I applied each piece with Bondaweb and then stitiched all the way round the perimeter with fHerringbone stitch. 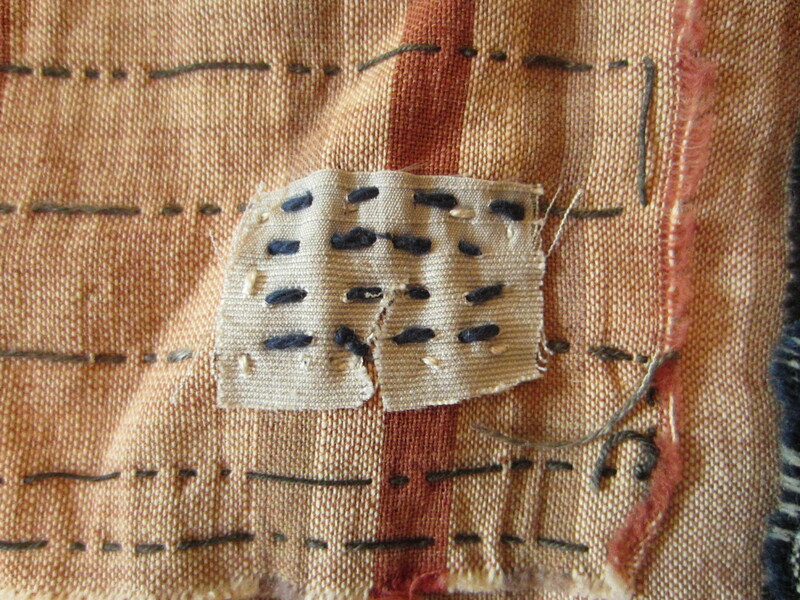 I then added sashiko stitching to some pieces – fabric and paper. I really like the end-result. It gives a flavour of France but looks like a piece of Japanese Boro!